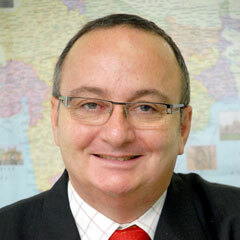 Geoffrey Conaghan commenced as Commissioner to India in December 2009. The Commissioner was a senior executive at Melbourne Airport between 1994 and 2009, in roles including marketing, corporate affairs and International airline business development. His career also included 9 years in the vocational education and training sector. Between 1985 and 1994 he held various positions with Tourism Training Australia, including founding Executive Director of the Tourism and Hospitality Industry Training Board, 5 consecutive terms between 1998 and 2009 as a Director of Tourism Victoria, the Government’s Tourism Commission and he was a board member of The Central Melbourne Group Apprenticeship Scheme 1991-1994, serving as Chairman 1992-1994.